I could literally eat salmon every day of my life and be a perfectly happy woman. Unfortunately, my family doesn’t agree with my love affair, so I have to be content with having salmon a few times a month. One thing I have converted my family to is a Ketogenic lifestyle. In simple terms, this mean we eat a high fat, low carb diet. People often raise their eyebrows when I tell them this, especially if it is a new idea to them. I encourage everyone to do their own research and find what feels best for their own body. 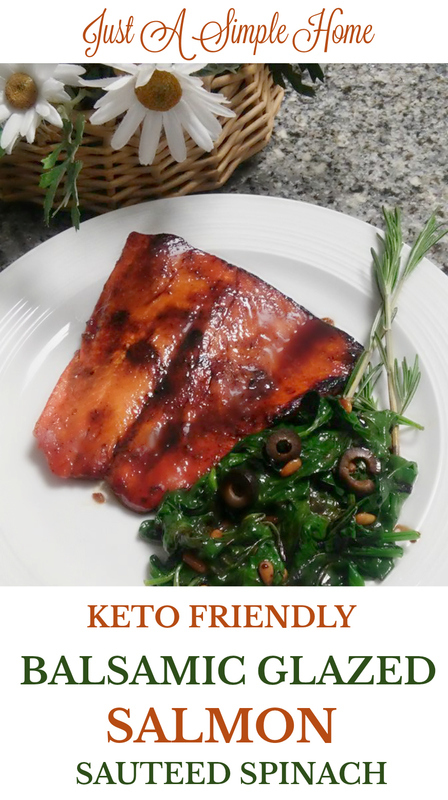 Since this is the lifestyle that feels best for me and my family, I was thrilled to find a new product that fit right in with the Ketogenic diet – LARD. Yes, you read that correctly. I found Armour Premium All-Natural Lard in the baking aisle at my local Walmart and was thrilled. Admittedly, I used to roll my eyes at the thought of cooking with lard. When recipes called for lard, I would replace it with butter. It really wasn’t until I started educating myself on the Ketogenic diet that my mind started to change. Armour Premium All-Natural Lard is one of the healthiest cooking fats you can use. Lard is a better source of monounsaturated fats than butter, coconut and corn oil! This is coming from someone who uses coconut oil for everything. I have been converted! You can use lard in so many recipes- baking, frying, sauteeing and more. It is extremely versatile, and it’s flavorless so it doesn’t change the taste of your recipe at all. Lard does not smoke at high heats either, so it is safe when frying or roasting. 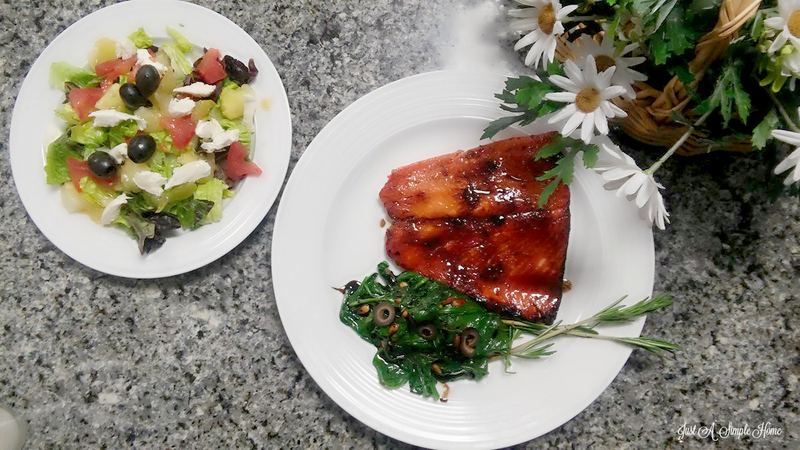 For an amazing Keto Friendly Balsamic Glazed Salmon, check out this recipe below. You can pair it with a side salad for some extra veggies and crispness. I am not the most exact whenit comes to measurements when I cook, but I tried to be as accurate as possible for you. If you like more spinach, add more spinach..more olives, add more olives. Make it your own and ENJOY! Preheat oven to 400 degrees. Line a baking sheet with foil and spray with coconut oil cooking spray. Cook the garlic in about a tablespoon of lard in a medium saucepan, until tender. Add the honey, balsamic vinegar, dijon mustard, and salt and pepper to taste. Simmer until sauce starts to thicken, about 3 minutes. Remove from heat. Place the salmon fillets on the baking sheet and brush with half the glaze, reserving the other half for the end. Bake the salmon for 6-10 minutes, until you can flake with a fork. Brush them with remaining glaze. Saute the bag of spinach in 3 T of the lard. Sprinkle in the pine nuts and sliced black olives. Add salt and pepper to taste. ENJOY! Have you ever cooked with lard in your recipes? Would you consider trying it now? This looks SUPER Yummy! My hubby and I also love Salmon but haven’t had it in awhile since it’s so expensive around here 🙁 it’s been relegated to once every few months or when we eat out (which doesn’t happen very often). I also LOVE sauteed spinach! I’ll leave out the olives, though hehe it’s one of the only foods I won’t eat ;P Pinning for later! We do salmon at least once every other week. This sounds like it will be in the rotation now! I love using Balsamic in recipes. This looks wonderful! I bet my husband would enjoy this recipe. I don’t cook with seafood much because I’m allergic but often look for different recipes for my husband to try! My husband loves salmon and I’m always looking for new flavors to try! This one looks like a keeper because we already love these flavors! I seriously need to try this! 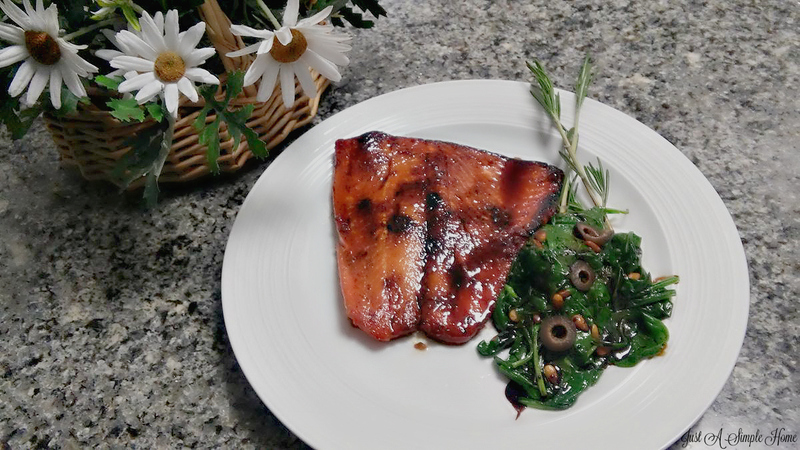 My kids love a maple salmon that I make, I bet this one would be a winner for them too! (and who can’t do without more winner dinners!?!) Will pin for sure!